I have a confession to make. I licked my plate, *shame. * Warm, sweet pineapple juice mixed with Thai chili sauce and crispy coconut bits was just too much for me to resist. 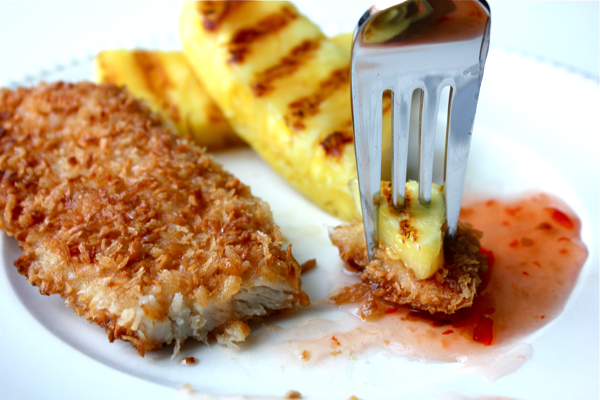 When dinner is this tropical, it’s sure to be a crowd pleaser. I can’t wait to make it again! To make it, start by getting some thinly-sliced chicken breasts. You can buy the chicken thinly sliced, or you can cut regular chicken breasts in half horizontally. Salt and pepper both sides of the chicken very well. Then, scramble one egg in one dish, and mix together 1/4 cup of unsweetened coconut flakes and 1/4 cup of panko breadcrumbs in another dish. If you want to make triple coconut chicken, you can whisk a few tablespoons of coconut milk in with the egg. Then, coat your chicken breast in the egg, let the excess drip off, and coat it in the coconut mixture. Press the mixture into the chicken so it sticks well. Heat 1 tablespoon of coconut oil in a skillet over medium-high heat, and cook the chicken on both sides until the breading is golden brown and the chicken is cooked through. The cook time will vary depending on the thickness of your chicken- mine took about 3 minutes per side. While the chicken is cooking, put some pineapple wedges on a hot, ungreased grill pan. Let them cook until they get grill marks. 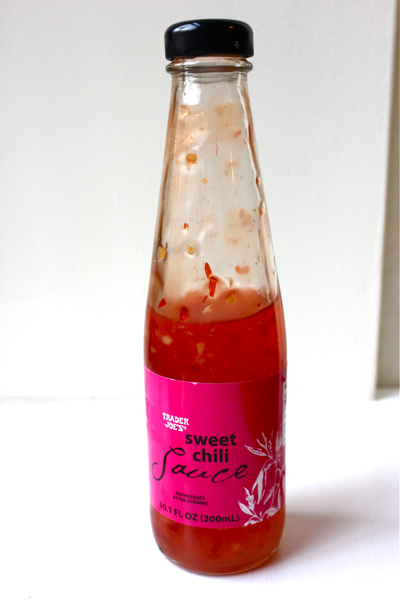 Also, make sure you have access to sweet Thai chili sauce. It is the glue that holds this dish together! While the chicken and pineapple are good on their own, this sauce really turns them into something crave-worthy and special. My dad is OBSESSED with this sauce. In fact, two separate people (myself included) bought him bottles as gifts before. My mom panics when Trader Joe’s runs out of it (even though you can buy it elsewhere), so it’s always safe to have a stockpile in the house. 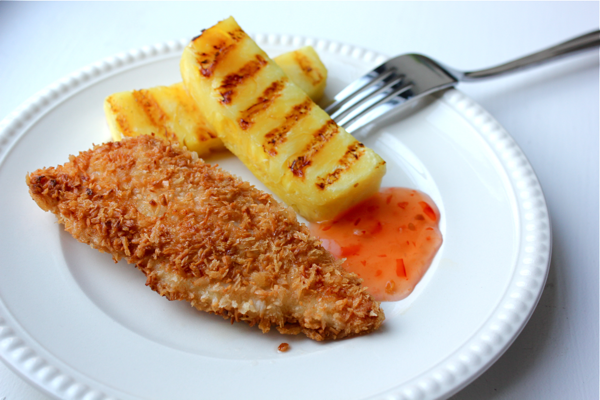 Serve the crispy chicken with a side of the grilled pineapple and a nice dollop of the chili sauce. The colors are beautiful and make me want to go to Hawaii. The taste is amazing, and, well, it makes me want to lick my plate. It’s best to get a bit of each component of this meal in every bite. I hope this one makes you smile! This recipe was adapted from Budget Bytes. I have a 2 year old son with a gluten intolerance, do you think this would be ok with only coconut and no panko? We haven’t found a bread crumb substitute that we like yet….. I haven’t tried it that way. Let us know how it turns out! Try nuts. I dredge my chicken in coconut flour, then in egg, then ground 1/4 C ground nuts (food processor) and coconut. You may have to make your own dipping sauce, there is gluten in everything! Just check the label. If he doesn’t have a peanut allergy that might be tasty, otherwise just use almonds. I make brownies with ground almonds instead of flour and they are yummy. Check out a Paleo diet for making gluten free goodies. The flavor on this was fabulous. My husband loved it and wants me to make it again, but I had no success with the cooking method. It burned twice and I just kept knocking off the breading and doing it again until the chicken was cooked. I did it on medium high heat like you said. Suggestions? Or maybe a suggestion on how to bake it? Also, I tried your man-pleasing chicken (which is what brought me back here) and it was perfect! Am making it again tomorrow for a group get-together! Here is another recipe where I bake whole chicken breasts in a similar coating, and I hope that method works out better for you. Thanks for trying!! I commented above with a method too. I saw it in my Bon Appetite magazine, they use regular flour. I made this tonight with the help of my family members. I whisked three eggs with a dash of garlic salt and a dash of pepper in one bowl. In another bowl, I combined a 1:1 mixture of Ian’s GF Panko Crumbs (that was the first time I ever used them!) 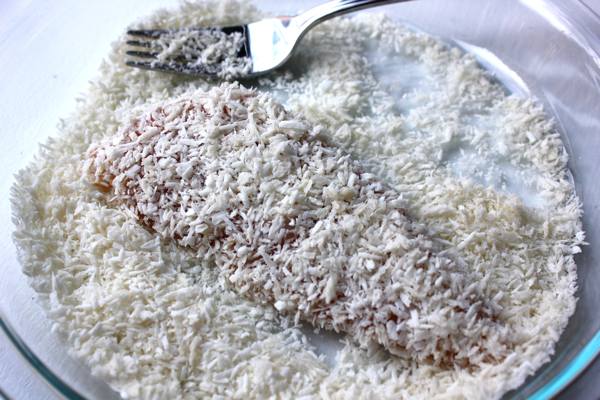 and finely shredded unsweetened coconut flakes. I started with 3/4 cup of each but since I had 3 pkgs of chicken tenderloins, I had to add more. In the beginning, I added 7 dashes of garlic salt and 7 dashes of pepper to the dry mixture. I had never cooked with coconut oil before so I did not feel 1 Tablespoon was enough in each pan. I used two pans to go thru all the chicken. I kept the chicken that was ready in the oven to keep warm. I am GF and could not use that sauce from Trader Joe’s so I had 3 options for everyone: wedge of orange to squeeze on the chicken, sugarless apricot preserves from Smuckers that I melted in the microwave, or Dole sugarless crushed pineapple tidbits. I served this with a salad and fruit. I put orange slices in everyone’s water. 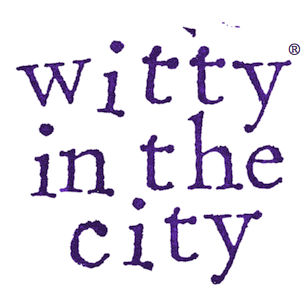 It was a big hit with everyone! Thanks for this recipe! I am so happy to hear that you made this recipe work for you. Sounds delicious!